Marking the entrance to Portland Harbor. Off Fort Road by the boat ramp inside Bug Light Park. Grounds are open to the public but the tower is closed. Constructed originally as a wooden tower standing only two feet above high tide on a man made breakwater, it was constantly being washed over by the salt water waves from New England’s many storms, making it a maintenance disaster. There was no original keeper’s house built initially, so sometimes during fierce winter winds and ice, keepers would crawl along the 1800 feet of breakwater at that time to the lighthouse to keep from being blown into the icy waters. The lighthouse was rebuilt with a very unique design of six fluted columns in 1875, modeled after the Greek architecture from the fourth century B.C. The original wooden tower was moved to nearby Little Diamond Island and became a lookout tower. The most recent restoration of the lighthouse and a new park for tourists that surrounds the lighthouse known as Bug Light Park was completed in 2002. 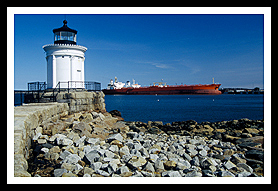 About a half mile from the Spring Point Light, is Portland Breakwater Light at Bug Light Park in South Portland, where you can relax and watch fishing boats as well as shipping traffic coming in and out of the harbor. There is parking near the lighthouse at Bug Light Park in South Portland where visitors can enjoy lobster and fishing boats as well as shipping traffic coming in and out of the harbor. For hikers and cyclists, the Harbor Walk Trail follows from Bug Light Park over the Casco Bay Bridge in and around the Portland Waterfront area. There is another new paved path that runs from Bug Light Park (at the eastern edge of South Portland) approximately 6 miles to Wainwright Field Athletic Complex at the western edge of South Portland. Portland offers trolley tours to explore Maine’s largest city. It is one of the largest seaports in New England, Maine’s largest and arguably most cultural city, offering lots of specialty restaurants and shops, artist galleries and museums to visit. Visit the historic Old Port district with lots of nineteenth century architecture to discover, boutiques and many restaurants to choose from. You can also follow various urban Portland Trails through the city. One waterfront park called the Easter Promenade provides nearly seventy acres of water views and recreation. North of Portland lie the towns of Falmouth, Yarmouth, and Freeport. There are lots of parks and preserves for those who want to explore the outdoors, and places to shop. For those interested in charter sailing in Casco Bay, or even taking private sailing lessons, Capt. Lyman Stuart will provide special tours on his thirty-foot sloop, the Marisa III. From US Route 1 North take exit 6A and bear right onto Route 77 (Broadway Street) in South Portland. Stay on Broadway to Pickett Street and follow all the way down to the end at Fort Road in front of the Marina. Take a left onto Fort Road and follow signs that indicate a boat ramp (1/4 mile). You will come upon a parking lot to the boat ramp alongside a warehouse; the lighthouse will be on your right. This lighthouse is about 1/2 mile from Spring Point Light. Boat cruises mentioned below may offer many types of cruises. 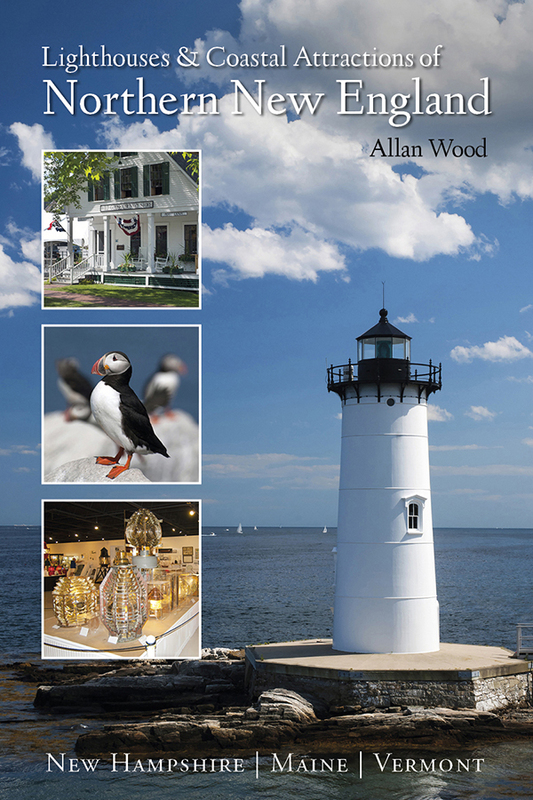 Some will pass by Portland Breakwater (Bug) Lighthouse during specific lighthouse tours, narrated wildlife and historic tours, sailing charters, fishing tours and other types of excursions. Weather is also a major factor in New England, especially on sailing excursions. Provides special lobster boat cruises that pass by the lighthouse.